The main road in the Korogocho slum in northern Nairobi is littered with garbage, a staple feed for goats and chickens that run about the slum. Open sewage flows in the ditches that line the road. Dusty makeshift shops along the road teem with flies. 27-year-old Jane Wanja, HIV-positive, lives with her two children, 9-year-old Shalon and 7-year-old Denis, in a small shack with mud walls in one of the back streets that lead off the road. Curtains are drawn over the bed at the back of the shack. Jane’s two children stand by the door as we enter, and the light hits the dirt floor. We sit on a makeshift bench. By the time our eyes adjust to the darkness, a small hand emerges between the curtains, drawing them apart and revealing Jane. She is lying on the bed, visibly weak. Unable to provide for her children, she fears that her daughter will end up like so many other young girls. Child prostitution is common. It is only thanks to her diminutive frame that Shalon has yet to attract the attention of men. Jane pulls up her sleeve, revealing the scars left by sores, and begins to weep. She, like many others who are infected with HIV, has now access to anti-retroviral drugs but no food or water. Donated by a Catholic mission, Jane’s generic anti-retroviral drugs from India cost around 20 USD per month, but the Word Trade Organization, a jealous guardian of intellectual property rights, is putting pressures on the country. If India makes more concessions to the WTO, anti-retroviral drugs in Kenya will skyrocket to over 300 USD per month. Irene Wanjiru Julius, a 39-year-old local community health worker, tends to Jane and her family with what little she has. She hands Shalon money to buy some paraffin to boil water and cook rice. As the little girl exits, her brother stands by his mother’s bed. Irene pours water into a bowl, and Alice Lasoi of the Pinnacle Relief Center tries to comfort Jane by stroking her hand. According to Alice, money trickles in, and there are some structures of assistance, but there is just too much to do. “In the end, people cannot have access to treatment because the pandemic rate is so high,” she says. Before leaving, the aid workers join hands and pray. We step outside the shack and follow another local community health worker, Prisca Watiri Murigi, to see 36-year-old Salim Njogu. About a hundred meters from the shack, we walk through a gate of green sheet metal that leads us into a small clearing. To the immediate left is a pit of raw sewage that flows into a ditch leading out from below the makeshift wall. Less than a meter across from it is an open door to Salim Njogu’s dwelling. Salim is lying in bed, the dirty sheets draping the mud floor. As he sits up to greet us, a vial of medication tumbles onto the floor. 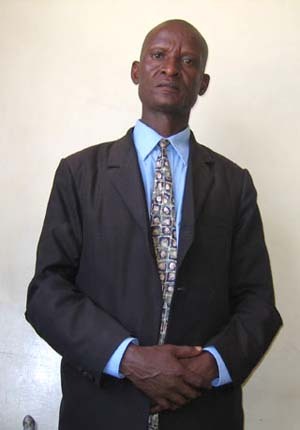 Salim is HIV-positive and is epileptic. Along the wall behind the bed are pictures of Mecca. His father has left for afternoon prayer. Salim’s right hand is deformed, and he complains of constant pain in his legs. Each patient treated for HIV/AIDS receives a medical record called a Pineapple Card. The card indicates weight, medication, sores, and other data. Salim is taking TriMune, Amitriptyline, Cotrimoxazole, Pyridoxine, and Phenobarb. He currently weighs 50.7 kg but his normal weight is 60 kg. His doctor tells him he must eat at least four times a day, but he has no income and cannot afford food. Salim claims that no aid workers from any NGO has ever visited him. He has been bedridden for over a year. He relies entirely on Prisca and Irene for aid, and, when he has strength, he goes for his checkup at the Catholic mission. “He’s saying that he cannot trust NGOs because the money goes to the wrong people who use it for their own individual purposes. He only trusts these two women,” says Alice. Prisca arranges the place a bit, and, as she begins to wash some plates, Salim speaks in a barely audible voice. “He says if he could get his energy, he would start his own business because nobody is going to employ him,” says Robert. Again, the aid workers join hands and pray. Salim, who is Muslim, sits with his head bowed and stares solemnly at the floor. 33-year-old Susan Nduku looks 60. HIV-positive, she is raising her 4-year-old daughter Martha whom she infected while breastfeeding. She is also raising her dead sister’s three children. 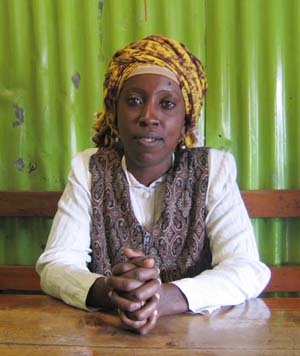 She says women diagnosed with AIDS in the villages are subject to “vivisepulchre.” Chased away from her village Machokos, she came to the slum with few options. To get by, she makes necklaces and bracelets from plastic beads. When I offered to buy some, Alice interfered and began to bargain for a lower price. Shocked, I watched in disbelief. “Poverty is threefold. One, the white man brought poverty to Africa and then taught the black man handout mentality. Two, Africans are lazy. Three, we are not going to change through handouts, IMF, or the World Bank. We are only going to change if the West is honest with Africa,” declares Pinnacle Relief Center Co-founder Joshua Kungu Nguujivi. Is Alice’s sudden haggling in my — a Westerner’s — behalf a street correlative of the co-founder’s “tough love” philosophy or a symbol of NGOs’ role under global capitalism, gently ministering to the poor even while helping keep their labor cheap for the West? In the meantime, Prisca and Irene, along with twenty-two other representatives from the eight villages that make up Korogocho, pool what little resources they have to build the Korogocho Community Health Clinic. The clinic has a few beds, tables, and chairs but lacks medication and doctors. Prisca and Irene are hoping to make the clinic operational soon. Despite no tangible government initiative to improve conditions, there still appears to be a certain order in the Nairobi slums. People who live in the slums are making sincere efforts to bring about change, but in the end the slums remain, a stubborn reminder of gross government negligence and policy failure. 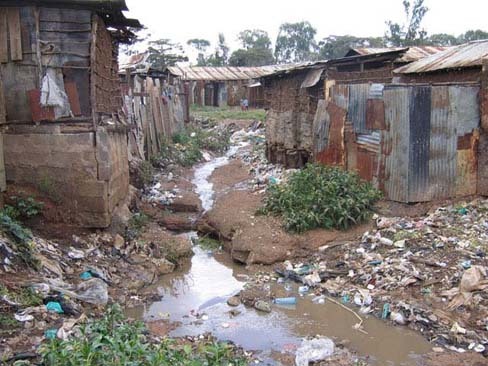 The depth of poverty in the slums in Nairobi is also a reminder that the Make Poverty History campaign, this year’s celebrity anti-poverty extravaganza complete with Bob Geldof, is no solution. Another CD, another concert, another wristband, selling poverty to the masses under the guise of actually doing some good . . . and another pat on the back. It’s not that that Tony Blair’s Commission for Africa’s March 2005 report had nothing useful to say: its recommendation that the West end unfair and unjust trade practices such as its subsidies for cotton and sugar as well as export subsidies is not unwelcome, considering that oranges from Spain in an uptown Nairobi supermarket are cheaper than those grown in Kenya. Nikolaj Nielsen is a freelance writer and is currently putting together a documentary on street children and artists in Tanzania: www.hapax3.info.